Page breaks divide worksheets into separate pages when you print. In Page Break Preview you can insert, move, or remove page breaks. 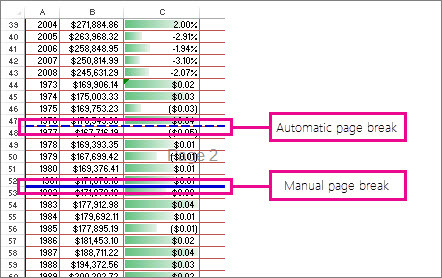 In Page Break Preview, dashed lines are page breaks Excel automatically added. Solid lines are breaks that were added manually. Tip: If you don’t want to change the page breaks, you can see what the printed pages will look like in Print Preview (File > Print).